Do you need an easy way to destroy your unwanted personal documents quickly and securely? Our domestic shredding for private individuals is available both on and off-site. Identity theft is a real and growing risk. Your personal paperwork can give fraudsters information about where you live, bank, work and even shop. Domestic shredding for private individuals allows you to dispose of confidential data with securely, with ease and cost-effectively. You could burn your confidential documents, but it’s very un-eco-friendly and bonfires are often reported by neighbours, with fines of up to £20,000 for unauthorised fires. The cleanest, easiest way to avoid the risk of identity theft is to have your personal documents securely shredded. We can help. At Shred Station, we offer a professional, affordable shredding service for people just like you, who want to make sure their personal data never falls into the wrong hands. We can come and collect all your unwanted personal documents and securely shred them at one of our state-of-the-art plants. 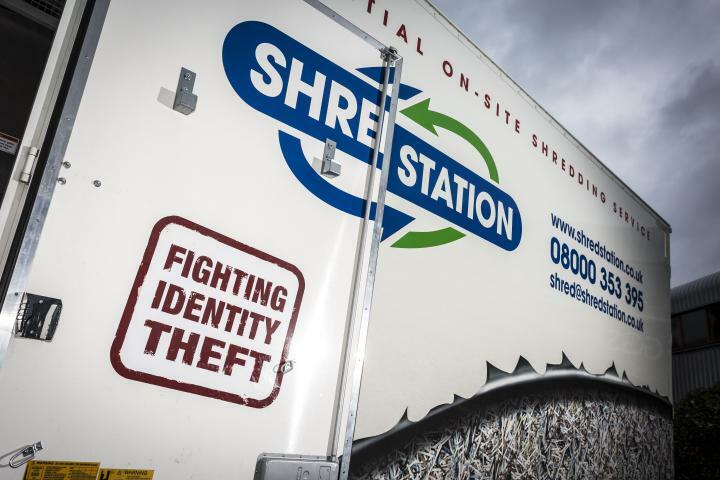 Alternatively, if you’d like even greater reassurance, you can use our mobile shredding service and watch your documents being shredded right there at your home. All the paper we shred is recycled and nothing goes to landfill. So our service is just as environmentally friendly as your home recycling collection – but much less risky. We’re established experts in destroying confidential waste. We work with dozens of leading firms and public-sector organisations, and can offer helpful, unbiased advice on all the issues around document-shredding.